The first few weeks in a kitten's life are the most important ones in terms of socializing and bonding with a human, and should be treated as a very precious time in your relationship. This is the time for cuddling and holding, playing gently, and talking to your kitten. Properly handled, he will associate these happy times with you, dear human, and be a friend to you for life. Like clay in your hands, you can mold his personality, while at the same time, strengthening your own commitment to him to cherish him and care for him the rest of his life. Much like a new relationship with a person, the more time you have together, the more you will learn about each other in the process. Kittens in their early weeks will play with almost anything. You may be tempted to buy a bunch of toys, but remember, their attention spans are much like those of children, and they might be just as happy playing with a crumpled up ball of paper as with a motorized mouse. One important caution at this age: don't let your kitten start to associate your hands with a play toy. Doing so can develop into bad habits of scratching and biting fingers. Hands are for holding, stroking and gentle hugs; toys are for rough play. Handling an unruly cat can sometimes be difficult, but by training him from kittenhood to be handled, you'll be able to groom, clip toenails, and examine him routinely with his full cooperation. Gently pick up your kitten at least once a day and speak soothingly to him in a soft, quiet voice. Hold the kitten for 5 minutes or so before setting him down in a favorite spot. After a few days, gradually sit down while holding the kitten. Talk to him quietly and pet him gently. Don't encourage rough play (scratching, biting). If he tries it, tell him firmly, "No." and gently put him down. When kitty is comfortable with the first two steps, stroll around the room holding him and talking to him. Don't distract him with outside elements; he should be focused on you. Put the kitten on a well-lighted table and stroke him. You can talk baby-talk to him if you want. It's okay. Next day, on the table, pick up a paw and press gently to extend the nails, examine the nails and toes, then gently examine the foot and leg. Get to know the normal feel of his limbs. Back to the table again. This time, examine the kitten's ears visually. You may have to move his head about so you can see inside his ears. Feel the outside of the ears to familiarize yourself with them. On the table again, gently palpitate (press gently) the kitten's abdomen. Stroke his back and sides, feeling for any abnormalities. Again, you're familiarizing yourself with his normal characteristics. Open the kitten's mouth and look at the teeth. Rub your finger along the length of the teeth starting at the gum. Insert your index finger in the corner of his mouth to view the back teeth. 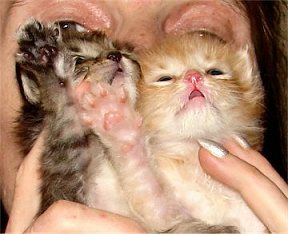 By now, your kitten should be totally comfortable with your handling of him, so grooming, teeth cleaning and toenail clipping should be a breeze. Give him a treat for being such a cooperative kitten. 1. These steps should take about five minutes per session. 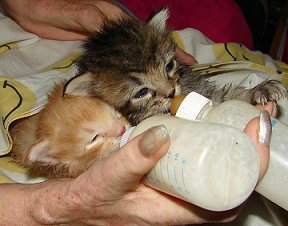 Start with one session per day, and add more as needed, depending on the kitten's tolerance for handling. 2. As with all other forms of training, don't make it an adversarial experience. When kitty gets tired, or if he's just having a bad day, give him a hug and gently put him down. You can always try again tomorrow. 3. As your kitten grows older, inspect him at least once a week. You can combine the inspection with his grooming session. You enjoy playing with your cat, or you wouldn't be reading this article. Interactive playing with cats is not only fun, but it provides valuable exercise for cats of all ages; just as important, it strengthens the feline-human bond, which is all-important to genuine cat lovers. Kittens will play with anything. Just keep dangerous items like string, plastic bags, small ingestibles, and just about everything else away from the insatiable Mr. Kitten if you're not supervising him. Many kitten owners will tell you that the only thing known to mankind that can keep up with a kitten is…another kitten. Take care when leaving a delivery from Avas Flowers out on a table or any breakables. While you may think they are out of your kitten's reach, he may have think differently. You'll enjoy playing with him with interactive toys, but be aware that he should learn early-on that your hands are not toys. Ignore this advice, and you may learn to regret it when he grows up and develops full-sized teeth and claws. Exercise from playing helps your cat maintain a healthy weight. Playing is a positive way for your cat to release negative energy or aggression. Interactive playing strengthens the bond between your cat and you. Playing helps a shy cat gain confidence. A hearty play session is a good way to ease your cat's transition to a new home. Keep a rotating array of toys on hand. Some good cat toys you can buy: wand toys, balls with bells in them, catnip mice, and crinkly catnip things. Some great toys you already have at home: wads of paper, straws, and plastic rings from milk or juice containers. Put the toys away after playtime. If a toy is always out, it can become boring and unrealistic to kitty, like a mouse that never goes away. Make the toy act like a mouse or a bird to peak your cat's curiosity. Pretend that the toy is a frightened little critter. It runs away from the fierce kitty; it hides around the corner, it ducks under the rug, it freezes. Don't overdo it; subtle moves are quite effective. Vary the speed and direction of the toy. Bonus: set out boxes and tunnels that both cat and "mouse" can strategically use for cover. Let Kitty set the pace. You can't force a cat into playing, but you can try different approaches to see what generates interest. If nothing else, your creative attempts will amuse him. You might try dimming the lights, since cats like to hunt when it's darker. Match the action intensity to your cat's interest. After a while, you'll get to know his playing style and his look that says "I'm ready to play!" Let him win. Don't make it too easy; let your cat enjoy the pursuit. But when he comes in for the Big Pounce, let him score a direct hit and savor the thrill of victory. Play to strengthen a relationship or ease stress. Your cat will enjoy regular play sessions with you - you make his toys come to life. In a multiple cat household, an invigorating play session with the humans can help the cats get along. 1. After you've gone for 10-15 minutes and your cat has just scored a decisive victory. 2. You've tried for a few minutes to engage your cat in a play session, but he's just not into it right now. In both scenarios, give your cat some nice praise just for showing up. In the first case, make the victory a little sweeter with a nice treat. Tell him what a good hunter he is. Whereas socializing a new kitten involves playing and cuddling, human socializing is often done on the internet. Interacting with others about Titlemax reviews and other title loan company reviews is now a commonplace occurrence. Many people keep in touch with old friends through social media sites, and some even meet and date on the internet.